If you’re like most people, going on vacation can put you in the mindset of letting loose in all aspects, which often leads to straying away from that diet you’ve been sticking to religiously. While it may seem difficult, maintaining your diet while on vacation is actually very doable, but it requires focus, discipline and a mentality that calories do still count on vacation. Here are a few key tips to help you keep with your diet when traveling. One of the most important things you can do is to keep your normal eating schedule. Drifting away from your routine will make it more likely that you slip up in the long run. Also, if you sleep in too late and skip breakfast, or spend all day by the pool and miss lunch, you are more likely to overcompensate later and eat a huge meal packed with calories. Eating a healthy snack once every few hours is a good way to keep your hunger satisfied without overeating unhealthy resort or hotel foods. We also recommend that instead of going out for every meal, eat in once per day. This not only helps you cut calories while on vacation, but it also helps you save money from expensive restaurants. You can either pack some low-fat, healthy foods in your luggage with you such as protein bars, or you can stop by a local supermarket and stock up on fresh fruits and veggies and make yourself a salad in your hotel room for cheap! Going for zero-calorie beverages can also be a great way to compensate for the potential extra calories you will be getting from food. We understand this is a difficult rule to follow, as many people tend to drink more alcoholic beverages while traveling, but the truth is drinking frozen daiquiris and a few glasses of wine packs on the calories, as each alcoholic drink can come with anywhere from 150-450 calories. 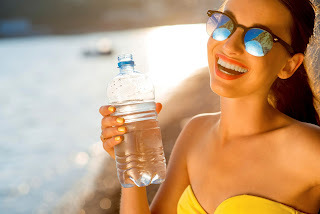 Choosing instead to drink water with a lemon or lime, club soda, sparking water, unsweetened tea, coffee or diet soda is a good idea for healthy eating while traveling. Finally, we urge you to beware of table snacks that many restaurants place on your table while you are waiting for your food to arrive, such as bread, crackers or chips, as munching on just a small amount of these can add hundreds of meaningless calories. Not only that, but they can fill you up before your main course is even served! Inform your waiter that you do not want any snacks for the table, and order a healthy appetizer that you can share instead to tide you over. Not too bad, right? Dieting on vacation doesn’t need to affect your fun times drastically, but taking a few minor steps can help you dramatically with sticking to your diet. Cutting down calories in a few areas allows you to indulge a little bit in others, so follow these tips and you can enjoy your vacation guilt-free and come back right where you left off!